Last winter, I shared nine of our favorite children's music albums with you. I still stand behind that list 100%, but in the meantime, we've added some more favorites. This one probably should have gone on the original list since we first listened to it years and years ago back when we only had two children instead of four. The first song we heard of his was "Wiggle Your La-Di-Dah" during library story time. I immediately tracked down the librarian afterward to find out the name of the album it came from. Several months later, we danced to "Drivin' in My Car" at our little music co-op. Both songs were instant hits because the words supply their own actions, and we've been pleased to discover that many of his other songs are just as dance- and action-worthy. A few weeks ago, Mike and I saw The Little Mermaid at our favorite local theater. Neither of us would claim it as one of our favorite Disney movies, but we've always liked the music, and I was dying to see what the set would be like at this theater (it did not disappoint). Anyway, we ended up loving the play (who knew?) and decided to purchase the Broadway soundtrack. As you might have guessed, our kids fell in love with it, too. I think they'd only seen the movie once and couldn't remember much of it, so it was entertaining to hear them try to piece together the details of the story based on the music. Within just a few short days, they had all the words memorized. This is not a children's album per se; the songs aren't about the alphabet or going to school or playing outside. But I only had to put it on once for my kids before they were hooked on these light, carefree songs. In fact, a few days ago, Maxwell was begging for it, but he couldn't remember the name of it. It wasn't until I, lucky for him, coincidentally put it on a little while later that he exclaimed, "This is it! This is the one I wanted!" It's recorded by a husband and wife team, and I just really enjoy their style, and so do my kids. Favorite song: I wish I could say "Up to Something Good" because parts of it really are my favorite, but it has this strange section in the middle that morphs into something reminiscent of Mission Impossible, and it just doesn't work for me (but now you're probably intrigued, huh?). So instead, how about "I Love You" because after Bradley heard it for the first time, he came up to me and said, "Mom, I do love you." This is not a music album. It's a podcast. And my kids are addicted to it. It's kind of like Bill Nye the Science Guy in podcast form. Each episode explores a different science topic. We've learned about lightning and thunder, cuttlefish, volcanoes in space, cats, bridges and tunnels, and underwater breathing. They interview scientists in the field and let kids ask questions and explain the topics in a way that's easy to understand. Just a warning: sometimes they get a little silly and ridiculous (again, think Bill Nye), but my kids don't seem to mind one bit. Highly recommend. This is another husband and wife team, but unlike Sunshine Collective where only of them sings and the other accompanies, Play Date is very much a joint effort with both of them playing and singing. Their music is fun with a good bounce and beat, and their voices complement each other really well. I often catch myself singing along while we're driving in the car. This is the group's first album. Their second album was recently released, and sadly, I was disappointed. Maybe I haven't given it enough of a chance, but it didn't even sound like the same group to me. So just a heads up there. This is another non-music-album recommendation (although I have seen that you can purchase a collection of the episodes in CD-format if you wish). In each segment, Naomi Lewin highlights a composer (or genre). The episodes are short, informative, and filled with the music of the composers being featured. I'd heard it at random times on our classical radio station, but it wasn't until recently that I realized you could access all of the past episodes on their website (which is another absolutely fabulous resource, by the way). Each one is about five minutes in length, which is the exact amount of time it takes us to drive Aaron to school. So we've been listening to one each morning, and my kids are now insistent on it. It has become part of our routine, and they won't let me forget. If you want to work a little classical music and history into your day without overwhelming your kids, this is the perfect solution. This Canadian music group has a very eclectic style. The first song on this album is reminiscent of the big band era, but the more we listened, the more I realized their songs touch on a wide range of genres. This group is fun and silly and teeters right on the edge between wacky and bizarre (two of the songs--"Ooligan" and "Dog Toy"--definitely fall off into the bizarre range for me). But without fail, we turn this on and immediately want to dance and sing along. As I come to the end of this list, I'm noticing a trend with most of the music on it. I keep wanting to use the same words to describe each one: lively, upbeat, fun. And this one is no exception. As soon as we heard the first song on the album, I knew it was going to fit our requirements. 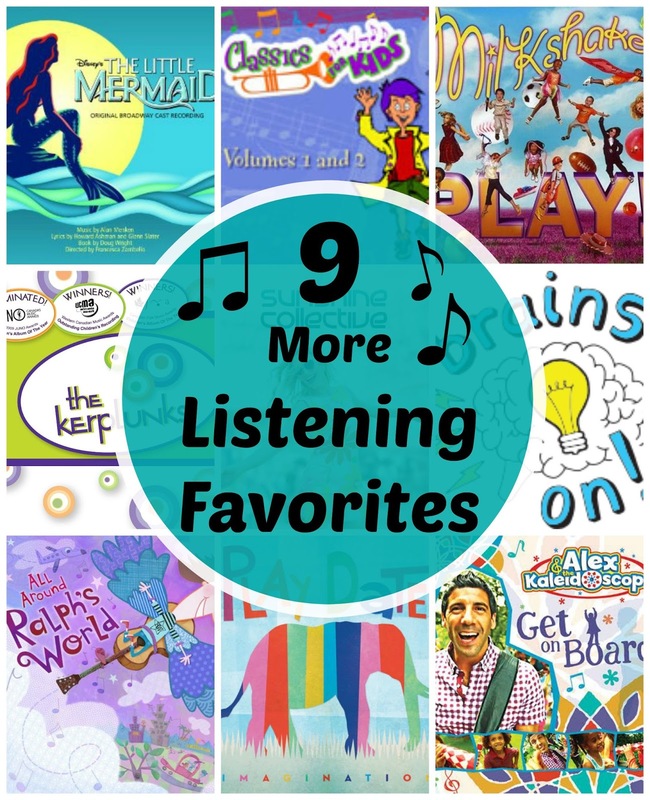 The songs highlight some of my kids' favorite things--bugs, dinosaurs, being outside--and do it with catchy melodies, a strong beat, and lots of percussion. I will say that there was one song on this album that surprised me. "Oh, Won't You Sit Down" has a strong Gospel feel to it. The rest of the album is not religious at all, so this one seemed a little out of place, but we still liked it. That's it for this time! Hopefully you've found a few new things to try, and, as always, please share your current favorites with us! We are always up for trying something new. *I received complimentary copies of Up to Something Good and Get on Board and was happy to give them each an honest review because we liked them both so much. We have tons of car time now that we live 20 minutes from anywhere, so I'm excited to try this list. Have you tried out Sharon, Lois, and Bram? My favorite kids group. And I have to report, were listened to the Classical Kids Vivaldi story this week, and got hooked on the violin concerto in a minor, and now Nathan wants to learn violin as his second instrument :). Let me know if you end up liking any of them! I'm glad you've been enjoying Classical Kids (the Vivaldi story was probably my favorite one when I was a kid). We'll definitely be checking out Sharon, Lois, and Bram.